Joseph Fletcher and the Church Mutual Improvement Society. The land in Bath Street and the lower side of New Street was acquired by Mr. Joseph Fletcher, retired lace manufacturer. He built two shops and a house on the land. Mr. Fletcher occupied the house. Lacemaker Joseph Fletcher was at 82 Bath Street, son of Samuel and Ann (nee Stockley). We shall meet him again when we visit his parents on the west side of Bath Street. According to the recollections of Old Resident (most probably Edwin Trueman), the idea for the formation of a Church Mutual Improvement Society had been mooted by a group of six young men in 1871 at the home of Bolton- born scripture reader Thomas Smith at 16 Springfield Terrace. Their first Society President was the then vicar of St Mary’s Church, James Horsburgh, and members met once a fortnight at the National Schoolrooms on the Old Cricket Ground, next to the church. ‘A circulating library was formed out of the personal possessions of the members who, lent each other their own books’. Old Resident also lists lectures and discussion subjects from the Society’s 1876 syllabus, including one by Thomas entitled ‘The Cycle, Golden Number, Epact, and Sunday Letter’. “In addition, there were nights devoted to readings, recitations, etc., with criticisms; and also a Parliamentary night. Many a pleasant and profitable hour I have passed at these weekly meetings forty years and more ago, when, I venture to say, there was a far greater desire than is shown to-day on the part of young men to seek intellectual improvement, in preference to becoming experts at billiards or dexterous manipulators of a pack of cards”. In September 1878 Joseph Fletcher offered two well-lit rooms in his Station Road premises – previously used as a lace manufactory — to the Church Mutual Improvement Society as a ‘reading room’, to be opened daily from 10am. to 10pm (Saturdays until 11pm). The offer was accepted and after a thorough cleaning and ‘refit’ by the Society members, the rooms were opened at the beginning of the following month. The larger room, about 30 feet long by 16 feet wide, was to act as the main reading room while a smaller room, 15 feet by 16 feet, would be used for games of chess, draughts, etc., for smoking, and for weekly meetings. The walls, up to a height of about four feet, were covered with Chinese matting while on the floor cocoa matting was laid, supplied by the Blind Institution of Nottingham. Two dozen chairs, several tables and a number of forms were also provided. The reading matter included The Daily Telegraph, The Standard, Nottingham Guardian, Sheffield Telegraph, Ilkeston Pioneer, Derby Mercury, The Graphic, Penny Illustrated Paper, English Mechanic, Fun and Judy. Membership was open to ‘Churchmen’ only, as this was “more likely to ensure the success of the scheme”. Honorary members – about 30 of the town’s tradesmen and gentlemen – paid an annual subscription of 10s 6d, while ordinary members paid 2d per week. Patron; His Grace the Duke of Rutland. K.G. Chairman and one of the Vice-Presidents; the Rev. Albert Eubule Evans, Vicar of Kirk Hallam. The Rev. Albert had lectured on several occasions to the Society members after its formation in May 1871. For example, in his talk on ‘The Rights and Duties of Women’ in 1876 he did not think that women were intellectually inferior to men, could see no objection to women becoming doctors of medicine, nor to single women exercising the franchise. In the following year he delivered ‘a most interesting and entertaining lecture’ under the title of ‘Olla Podrida’. This is the name of a Spanish stew but the Rev. Albert was no 19th Century Gordon Ramsey. Instead he took its meaning to be ‘a mixture of varied contents’, or ‘potpourri’, and proceeded to discuss the various elements within the universe, and demonstrated a number of chemical experiments to an appreciative audience in the National School. A number of such experiments also accompanied the Rev. Albert’s lecture at Shipley National School-rooms on ‘Fire’ just before Christmas Day of 1877. “I need hardly assure the Society of my sincere interest in its welfare. If it will but keep to its proper functions, avoiding ‘the questions which gender strife’ and ‘endeavouring to keep the unity of the spirit in the bond of peace’, it can hardly fail to prosper. “My heart’s desire is that ‘every good and perfect gift’ may rest upon them (i.e. the members)”. In February 1880 the Society acquired a bagatelle board – ‘a source of great attraction’ – donated by Dr. Samuel Armstrong of Dalby House. In January 1882 membership of the Society was opened up to Non-Conformists although the Committee was still exclusively ‘Churchmen’. In that same year fund-raising began in earnest, to finance the product of an idea muted in late 1881 … a Church Institute building. An Easter bazaar in 1882 raised nearly £200 and was followed by several generous donations and subscriptions amounting to another £400. Henry James Kilford, architect and Borough Surveyor and an Institute member, offered to provide building plans free of charge, and so … in an Easter Monday snowstorm, 1883, Edward Miller Mundy laid the foundation stone on ‘an awkward plot of land’ in the corner of the Market Place. And on that same plot, over the following year, arose ‘an unpretentious but substantial brick building, of attractive appearance’ in front of which was ‘ a pretty lawn, bordered with palisades, and at the rear is sufficient space to make a bowling-green’…. all provided at a total cost of £1400 by local builder William Warner. Inside were rooms for reading, smoking and billiards, a museum and a library, a large lecture room and a coffee tavern. The formal opening was performed in April 1884 by Lord Egerton of Tatton, a man who had no obvious connection with the town, and as usual on such occasions, evergreen arches were erected, mottoes were displayed, flags were flown, church bells rung and processions formed, while the general public … at least those interested and not at work … looked on. Edwin Trueman had composed a special hymn ‘Creator of the Universe’ which was heartily sung. Conspicuous by his absence was the Vicar of St Mary’s Church, John Francis Nash Eyre, although in the obligatory speeches made on the day it seems that several oblique references were made to the state of discord within the local congregation at that time. At that time the eight trustees of the Institute were Henry Hoggard Beaumont, needlemaker Phillip Ellis of Tatham, Ellis & Co., Charles Potts, Edwin Trueman, John Flint Walker, Robert Wood, George Maltby and William Flint. In 1871 this was 83 Bath Street. Born in May 1830, William Wade was a son of builder Benjamin and Mary (nee Haseldine) of Bath Street and traded in Bath Street as a grocer for over 40 years. He was a member of the Highway Board, the Local Board and was the town’s second mayor. He was also a churchwarden for the Rev. James Horsburgh. Once when visiting the Rev. on church business he found James in the garden using some wood. (A more complete account of the offices he held can be found in Trueman and Marston). In November 1858 he married Betsy Chapman, daughter of farmer John and Elizabeth (nee Shaw) of Conningsby, Lincolnshire.Betsy died on April 3rd 1891, just two days before the taking of the census. That census shows William’s house at (then) 96 Bath Street full of her visiting and grieving relatives. William died in November 1893, aged 63, while visiting his late wife’s relatives at Mareham-le-Fen in Lincolnshire. For three or four years previous he had suffered a series of ‘paralytic attacks’ which had curtailed his active participation in local public affairs. William Wade as Mayor of Ilkeston 1888-1889. (courtesy of Ilkeston Reference Library). then Mr. Haynes, ironmonger had the corner shop. Born in Alfreton in 1840, watchmaker and ironmonger Joseph Haynes junior was the son of ironmonger Joseph and Grace (nee Ridge) and as a young man went to Leeds to learn his trade … on the 1861 census he is boarding with Benjamin Jefferies, watchmaker and silversmith of Wellington Street. In the same area of that city was the Starkey family of West Street … cloth dresser William, wife Mary and daughter Ann. Joseph and Ann found (or had found) each other … perhaps the fact that Joseph’s employer and landlord Benjamin was already married to Ann’s older sister Eliza had something to do with that. In 1863 Joseph and Ann married in Leeds and within the year had settled in the shop at the corner of Bath Street and New Street. But what brought Joseph to Ilkeston? The Ilkeston section of the Harrison, Harrod & Co Directory of 1860 includes a ‘James Haynes, ironmonger, oil merchant &c, of Bath Street’. 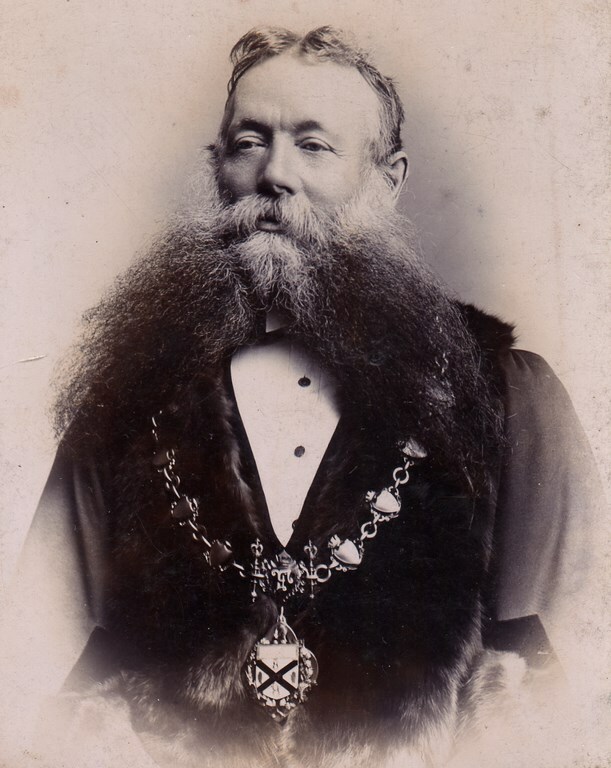 This could have been Joseph’s elder brother who also followed in the family trade and who could have ‘pioneered’ a business at the Bath Street premises, although he appears to have lived in his home town of Alfreton throughout the 1860’s. On the 1861 census James is at Church St, Alfreton, trading as an ironmonger. 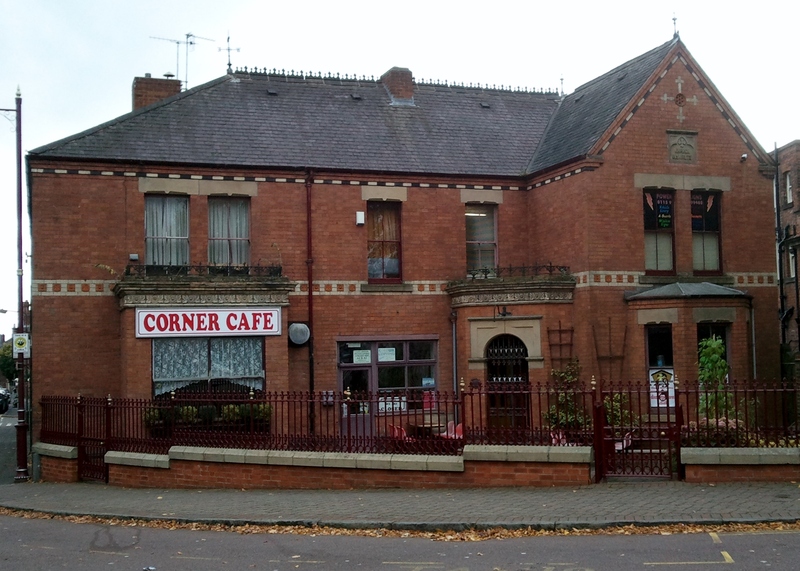 However at this Station Road corner in Ilkeston is 25-year-old Alfred Beeston, listed as an ironmonger’s assistant … most probably employed by James. Ten years earlier both James and Alfred were together, serving as apprentices for the iron founder and ironmonger James Mellard in Rugeley, Staffordshire. At Alfreton James had married his first wife Mary England, daughter of Alfreton saddler Joseph and Fanny Elizabeth (nee Mee), in May 1854. Less than four years later, in January 1858, Mary died, and in June of the following year Joseph married Sarah England, younger sister of Mary. Two daughters — Florence Grace and Lillian Mary — were born to the couple before Sarah died in December 1866, followed by James a little less than a year later. The England sisters had a younger brother also born in Alfreton, the pianist and ‘professor of music’ blind Joseph England who was living in Ilkeston throughout most of the 1860’s .. and, from 1863, with his wife Maria Brassington England (nee Mayer). The orphaned sisters Florence and Lillian were initially taken in by their uncle. We shall meet Blind Joseph England later in Nottingham Road. Joseph Haynes died on February 29th 1880, aged 39, leaving his widow Ann with two children – William Joseph and Harold Arthur. (Son Laurence Starkey Hayes had died in 1875, aged 5). Ann continued to trade at the same premises, helped by her two sons, and she died there in 1901. And now let’s go more into New Street (Station Road).